These very attractive, miniature leaf succulents vary from little star-like rosettes to stemmed plants with compactly arranged leaves, very often with significant contrasting leaf tubercles. Members of this small, southern African endemic genus (occurring in South Africa, Namibia and Swaziland), are perfect for container gardens or small rockeries. Haworthiopsis is a genus of dwarf, succulent plants, that was previously included in Haworthia subgenus Hexangularis. Based on evidence from molecular research on generic level relationships among the alooids, the genus Haworthia was split into 3 segregate genera, which roughly corresponds to the previously recognized subgenera. The name Haworthiopsis alludes to the similar appearance of these plants to other species of Haworthia and to the fact that they were previously treated in the latter genus. Members of the genus Haworthiopsis are characterised by their small rosettes of succulent leaves that are generally harder and tougher with a thicker epidermis, than those of species of Haworthia. Leaf fibres are also present in some species. Leaf characters vary tremendously among the different species of Haworthiopsis in terms of shape, size, colour and texture. Plants can be solitary or suckering to form dense clumps, and some even offset by means of underground stolons. Some species are stemless, whereas others have their leaves compactly arranged around elongated stems of up to 400 mm long. Plants produce thin wiry inflorescences that are usually unbranched and erect or carried at an angle. Flower buds are carried erect, but when flowers open they are horizontal or slightly erect. Flowers are bilabiate (with a distinct upper and lower lip), with recurved tips (especially so for the lower lip) and are generally white or whitish, with a darker greenish or brownish central vein on the tepals (flower leaves). The species in the genus mostly flower in spring and summer in the southern hemisphere, but sporadic flowering is not uncommon, especially in cultivation. Fruit are 3-chambered capsules that dry and split open to reveal the small black, angular seed. Although some species are relatively fast growing, some are much slower to reach maturity. These perennial plants have a fairly long lifespan and in cultivation can survive up to several decades. The genus Haworthiopsis contains several species of conservation concern. At species level a total of 8 species are regarded as threatened taxa. Of these 1 (H. woolleyi) is Critically Endangered (CR), 2 (H. bruynsii and H. longiana) are Endangered (EN), and 5 (H. attenuata, H. koelmanniorum, H. limifolia, H. pungens and H. venosa) are Vulnerable (VU). A further 2 species (H. fasciata and H. sordida) are regarded as Near Threatened (NT) and the remaining 8 species are Least Concern (LC). To date, none of the infraspecifc taxa have been evaluated on the South African Red List. Main threats include medicinal plant harvesting, habitat destruction because of urban and industrial expansion, overgrazing and competition from alien invasives, and unscrupulous collecting of wild plants for the succulent plant trade. A total of 18 species and 25 infraspecific taxa are recognized in Haworthiopsis. This genus is restricted to southern Africa, where it occurs in the central, southern and western parts of South Africa and southern Namibia, with a small disjunct distribution in western Mpumalanga and the adjacent Limpopo Provinces of South Africa, and another disjunction in northern KwaZulu-Natal and southeastern Mpumalanga, in South Africa, as well as Swaziland and possibly southern Mozambique. The centre of distribution for Haworthiopsis is in the Eastern Cape Province of South Africa where 14 of the 18 species occur, with 10 species being endemic to this Province. Members of the genus are found in a variety of habitats and at a wide altitude range (30–1 800 m above sea-level). They occur widespread in both winter and summer rainfall regions, as well as areas where rainfall could occur at any time of the year. Plants prefer stable rocky terrain that are favourable for their survival; these can include flat rocky ground or slopes, rocky outcrops or sheer cliff faces. Most of the species are rather leathery-leaved, with a thick and hard epidermis (outer cell layer of the leaf) making it possible for the plants to survive long periods of droughts and to withstand wild fires. Although some species are quite fire-resistant, they generally favour very rocky areas with less overgrowth to avoid fires. The small flowers are pollinated by proboscis flies or bees. Plants in this genus are often browsed by porcupine, tortoises, rock hyraxes and by Orthoptera (grasshoppers and crickets) insects. Most of these species are well adapted to vegetative propagation. Therefore, when plants get disturbed and broken apart, several of the pieces will start rooting again, to form new plants. 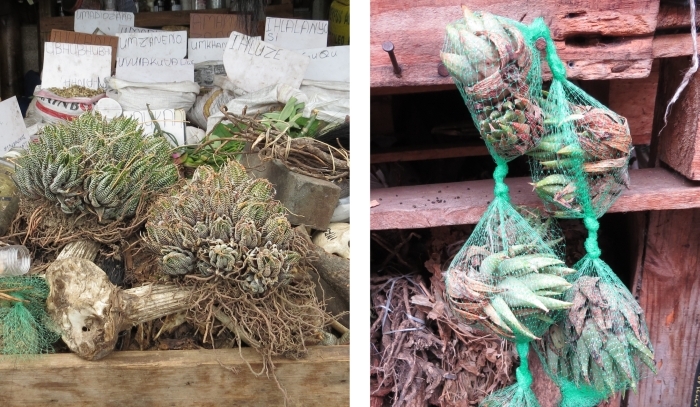 Haworthiopsis species are heavily traded for medicinal purposes and can usually be found in large numbers in muthi markets. The most preferred species in the Eastern Cape seem to be H. attenuata, whereas there is a preference for H. limifolia outside of the Eastern Cape. When either of these species is not available, they are apparently often substituted with each other, or with H. fasciata, H. coarctata and even Aristaloe aristata (= Aloe aristata). Although these plants are cultivated by some healers and traders, the large demand for and popularity of these plants have led to a decline of wild populations throughout their distribution range. Species of Haworthiopsis are used for a variety of ailments and is often included in the concoctions prescribed by traditional healers. It is most often used as an intelezi plant to ward off evil spirits. Historically it was reportedly also used during times of war, as it was believed to make the warriors fearless. It is also used in mathithibala or love-binding spells where the person on whom the spell was performed then loves the other, but is at the same time deeply afraid of that person, thus preventing him/her from doing something wrong in the eyes of the person who performed the mathithibala. Species of Haworthiopsis with their immense variation in habit, leaf colouration and tuberculation, shapes and sizes (even within a species or variety), makes them very popular among succulent plant collectors. These plants are widely cultivated and traded globally. They are also often used in horticulture as pot plants or in small rock gardens. Some species like H. attenuata and H. limifolia have been grown in very large numbers commercially for the pot plant market. Haworthiopsis plants are best suited to container gardening. In frost-free areas with a lower rainfall, species like H. attenuata, H. coarctata, H. glauca and H. limifolia can be grown successfully in rockeries when planted in sheltered areas amongst rocks, where they will form clumps or clusters over time. Even though most species are hardy and can tolerate full sun, they flourish in semi-shaded positions, but brighter light conditions are needed to bring out the leaf colourations. Other species like H. bruynsii and H. koelmaniorum are only suitable for cultivation in containers and are best kept under cover and out of high rainfall conditions. They can be planted in terracotta pots using a well-drained medium. Species in the genus are mostly and easily cultivated from stem-cuttings or by removing offsets from the mother plant. Stem-cuttings can be removed during the warmer parts of the year, left to dry for a couple of weeks and planted shallowly in a well-drained medium. Planted cutting should be watered sparingly until the plant has rooted and shows signs of growth. Offsets can be removed when they have started developing their own roots. Older clumps can also be divided into individual plants and replanted. Haworthiopsis species can also be propagated by seed, although artificial pollination is often required, and the development of the seedlings is a time consuming process. Seeds should be sown in spring in a fine mixture of sand and composted bark, sprayed lightly on a daily basis to keep the surface slightly moist. Germination could commence after 2 weeks and seedlings can be transplanted into individual pots after the first or second year. The zebra plant is an attractive rosette-forming plant, with erect to spreading leaves exhibiting an array of different leaf tubercle variation. Plants range from about 50 mm to 100 mm tall and form dense clusters. The white tubercles range from fine to conspicuous tubercles, scattered over the lower leaf surfaces, or forming confluent bands reminiscent of zebra bands, hence its common name. This species is found widespread in the Eastern Cape, from near the Gamtoos River in the west to the Mbashe River in the east. This species has 2 described varieties, var. glabrata and var. radula. This stemmed species of Haworthiopsis is easy to grow and makes excellent rock-garden subjects. Plants are stemmed, about 50–200 mm tall, growing longer as the stems become decumbent with age. Plants proliferate from the base and along the stem to form dense clumps. The lower leaf surfaces may be smooth or tuberculate and are clasping, covering most of the length of the stem. This species is found in the Eastern Cape, from near Port Elizabeth in the west to the Fish River in the east. The generally smaller growing var. adelaidensis has a narrower distribution range. This species is similar in appearance to H. coarctata and H. reinwardtii by sharing the same stemmed growth habit, but differ in having glaucous grey-coloured leaves. In most forms the plants are without distinct white tubercles, however, white tubercles are found on the leaf surfaces in plants of the var. herrei. In this species, plants also proliferate from the base and occasionally along the stem to form clumps, growing up to about 200 mm tall. This species is found further inland than the above-mentioned and is known from relatively drier areas. This is the only species in the genus known to occur in the northern bushveld of Limpopo and extending its distribution into Mpumalanga, where the var. mcmurtyi occurs in grassland. This window-leaved species has star-like rosettes of spreading leaves that grows to about 100 mm in diameter. The var. mcmurtyi is very similar in appearance, but is generally much smaller in size than the typical variety. Plants are slow-growing and best suited to cultivation in containers, planted in a well-drained medium. Plants rarely produce offsets and it is best propagated from seed or leaves. This species is well suited to rockeries in summer rainfall areas. Plants form attractive rosettes of spiralling leaves, varying from being smooth to tuberculate, often with the tubercles forming confluent bands or ridges. The only species in the genus known to occur in KwaZulu-Natal; it is also found in Mpumalanga and extending its distribution into Swaziland and possibly Mozambique. This species has become rare in its natural habitat because of over-collection for traditional purposes. Several varieties are recognised: var. arcana, var. gigantea, var. glaucophylla and var. ubomboensis. Plants are stemmed, about 50–150 mm tall, growing longer as the stems become decumbent with age. Plants proliferate from the base and occasionally along the stem to form clumps. This species is similar in appearance to H. coarctata, but has narrower and denser arranged leaves and more conspicuous tuberculation. Lower leaf surfaces are generally densely tuberculate and are clasping, covering most of the length of the stem. This species is found in the Eastern Cape, from west of the Fish River in the west to near East London in the east. The var. brevicula is generally smaller growing and has denser tooth-like tubercles. The species is best suited to containers; it has a highly stoloniferous habit and produce many plantlets to eventually form a dense mat of compact rosettes. The starry rosettes (20–80 mm in diameter) have spreading to recurved leaves, with lines and reticulations, that are windowed on the upper surface. This species is widespread and is known from the drier interior of South Africa where it is found in the Western Cape, Eastern Cape, Northern Cape, Free State and North-West Provinces. The distribution of this species also extends into Namibia. The var. crousii is similar in appearance to the typical variety, although much more robust and less proliferous. This species has a very interesting distinctly 3-ranked leaf arrangement along the length of the stem. It is a slow growing, hardy species that is best suited to cultivation in containers. It is found mainly in the Western Cape, but also extends into the Eastern Cape. It can be found at lower altitudes on rocky areas closer to the coast, to further inland at higher altitudes. It is a variable species, both in terms of size, as well as leaf form and colouration. Bayer, M.B. (1971) Changes in the genus Haworthia. Cactus and Succulent Journal (US) 43: 157–162. Crouch, N.R., Smith, G.F., Nichols, G., Burden, J.A. & Gillmer, J.M. 1999. A species recovery contribution for Haworthia limifolia var. limifolia, the umathithibala of the Zulu. Aloe 36: 8–13. Gildenhuys, S.D. 2017. Haworthiopsis — an illustrated taxonomy. Aloe 53(1): 4–78. Red List of South African plants. 2017. Genus Haworthiopsis. http://redlist.sanbi.org/genus.php?genus=15464. Accessed on 3 August 2018. Rowley, G.D. 2013. 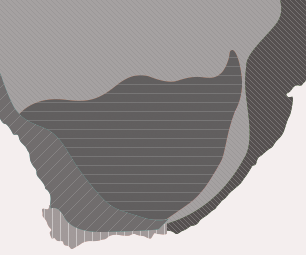 Generic concepts in Alooideae — Part 3 Amended: The phylogenetic story. 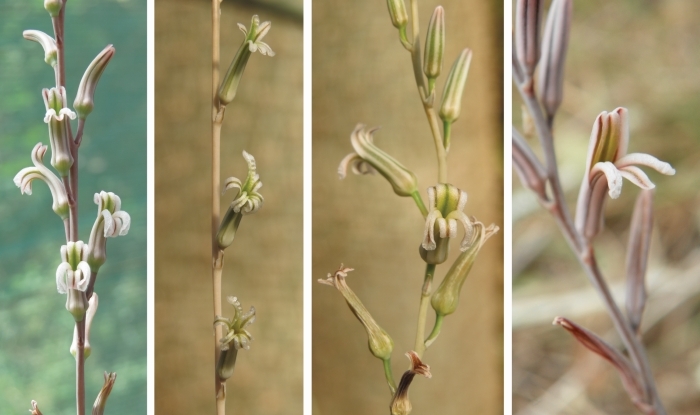 Alsterworthia International Special Issue 10: 3–6. Smith, G.F., Crouch, N.R. & Condy, G. 1997. Haworthia limifolia var. limifolia. Flowering Plants of Africa 55: 24–29.